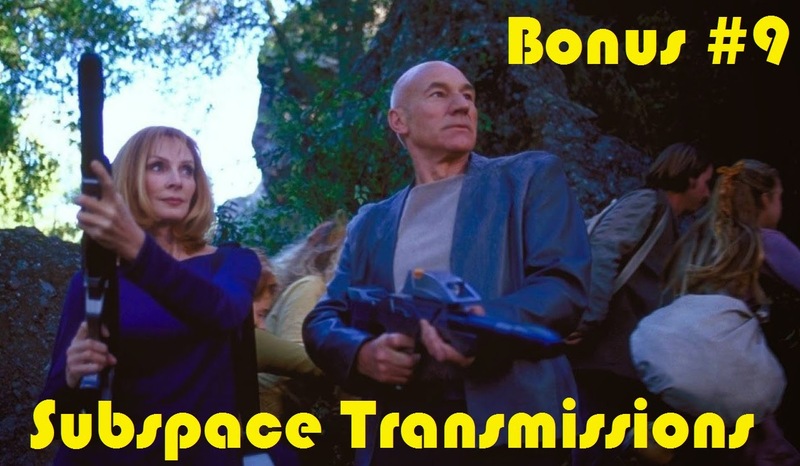 Subspace Transmissions: A Star Trek Podcast: BONUS EPISODE 9 - "STAR TREK: INSURRECTION"
After the huge critical and commercial success of 1996's First Contact, it was only logical that the TNG crew's next cinematic away mission would be twice as good, right?! In this latest Film Flashback bonus episode, hosts Cam Smith and Tyler Orton, along with special guest Tom Ball, return to the Ba'ku homeworld in an attempt to determine how Insurrection holds up almost twenty years later. Is it as cringe-inducingly bad as many fans frequently claim, or are there nuggets of a good movie visible on screen? From mamboing Picard, to weird cave collapses and F. Murray Abraham's high-pitched squeal, we hit all the highlights and lowlights on a grand journey of understanding and discovery. So saddle up, lock and load, and, uh, enjoy! Wanna appear on the show? Shoot us a 30 to 60-second audio clip telling us your thoughts on STAR TREK INSURRECTION and you could take the spotlight in an upcoming program! You can also send any other questions, topic ideas or feedback to subspacetransmissionspod@gmail.com! May you all find that one perfect moment!